By the late Rev. Camille Graff, S.J. The late Rev. Camille Graff, S.J. was a missionary working in the Diocese of Shanghai under Bishop Kung before Bishop's incarceration by the Chinese Government. Rev. Graff was expelled from China in the early 1950's, later worked subsequently in Taiwan for many years and died there. These two letters were originally written in French, and were translated into English by an unknown person. The first letter commemorates Bishop Kung's 30th anniversary of his imprisonment. The second letter reiterates the author's unwavering belief in Bishop Kung's faith and allegiance to the Pope after the media speculated otherwise on the occasion of Bishop Kung's release from prison in 1985. On Sept. 7 you will begin your 30th year "in vinculis pro Christo", in the Shanghai Communist Prison. In August, this year, you have entered your 84th year of age. You have been a Priest for 55 years, and of them 35 as a Bishop of the Church of Jesus Christ, a short while in Soochow and the rest in Shanghai. Almost half of your life in prison, in a long "offertory" of yourself. A long "Holy Sacrifice" in union with Christ on His Cross. By love of Him. By love of His Church. By love of the Church in Shanghai, which has been entrusted to you by the Vicar of Christ on earth: the Bishop of Rome. And nothing has been able to shatter your faith in the true Church of Christ. God knows and History will know for ever that it is the only one true reason for your incarceration. For Jesus-Christ and for His Church, all along the centuries, persecutors have given and published false reasons. But "Truth" always prevails. The Martyrologium is full of names of people who have been accused falsely by their persecutors from Nero to Mao Tse Tung; thousands of them through almost 20 centuries. Your name will be for ever among theirs. Ignatius of Shanghai will be for China what Ignatius of Antioch has been for the early Church in the Roman Empire. He has fought strongly for Christ and His Church and has shed his blood. You have fought for the same reason, and you have endured 30 years of prison for Christ and His Church. Going to his martyrdom Ignatius of Antioch refused any compromise. You did the same from the very start of persecution, when the Communist Regime tried to separate the Catholic Church in China from Rome. Though you knew perfectly well what it would mean for yourself and for the other Priests and Christians. Like Christ tempted by Satan, who promised Him "all the world" if He would summit himself to him, you refused the promise of a "Patriotic Church" separated from Rome. You knew it was "de facto" a "Schism". Your strong faith and clear spirituality told you that absolutely no reason, "sub specie boni", could be an excuse. For you, "heroism" was not a simple "option" among others. It was the call of Christ to all baptized people: "Anyone who does not take his cross and follow in my footsteps is not worthy of me" (Math.10-37). And as a good and loyal shepherd you taught it to your Christians. ou could not accept either the false reason a few Bishops and some Priests tried. To keep some visible church and some religious practice, at any cost! But at what price? To deny publicly the bond with Rome! To consecrate ( and be consecrated ) Bishops, without the consent of Rome. Which, in the Canon Law, brings "de facto" excommunication. Some of them thought: "in my heart I stay faithful to Rome, but publicly I speak otherwise....!" You could not accept that either. You remembered Jesus telling: "All you need say is "Yes" if you mean yes, "No" if you mean no; anything more than this comes from the evil one." (Matt.5-37). You knew perfectly well that the bond between Christ and His Church is such, that you cannot separate the Faith from fidelity to His teachings. Likewise you knew it is impossible to separate Christ from His Vicar on earth. For you, as for St. Catherina of Sienna, the Pope is "El dolce Cristo della terra", the kind Christ on earth. So, you refused the "Schism" and went to prison. Many other Bishops and Priests went too. Your 30 years in prison already, is, and shall be for the future, the true seed of the Catholic Church in China. Others have already died. 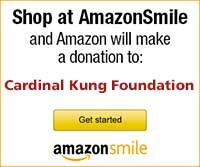 But thanks to you all, the true Catholic Church goes on and develops on Mainland China. Unseen by many. But really living and growing. It is not the Patriotic Church. This is only the "Puppet Show" from the atheist Regime, to destroy the true Faith in China. But the true Church is you, the martyrs who have shed their blood or their freedom to stay faithful to the only Church of Christ, whose head is in Rome. Your jailers may have shown to you some articles in some magazines, in Europe or America, with wavering attitudes towards the Patriotic Church. Some hesitate to speak of "Schism". Some think a "double-attitude" may be permissible "for some good"... Finally they seem not to see any difficulty in having "two Bishops in Shanghai, without calling the second one "usurpator" and "schismatic". But, dear Bishop Ignatius, don't be afraid. They are only a "noisy minority". They are used to speak and to write. Behind them there is a large "silent majority" that your jailers will not let you know and hear. But we are with you. We venerate you and those who, like you, have stayed faithful to Rome, with the Christian heroism that cannot be challenged. You, with them, are the only true Catholic church in China. You, with them, have saved the honor of China, showing the true Christian Patriotism; God and our faith above all. You, with them, are the seed of the future. Not the "lapsi", the fallen ones. Let us pray to God that He may "convert" them and bring them back one day in the only true Roman Flock. Dear Ignatius of Shanghai, in the loneliness of your prison, the evening of your life has begun. We strongly believe and fervently pray that the Holy Spirit may tenderly whisper the same words to your soul. We earnestly beg Our Beloved Mother of Zose, to be at every moment with you with Her motherly Love and tender care. In the free province of Taiwan, the Chinese Catholics follow your steps and those of the glorious Martyrs of Mainland China: we love and stay strongly devoted to the Holy Father in Rome. As He told us, we try to be the "bridge" that will strongly reunite the only "one" Catholic Church in China, that of the Martyrs and that of Taiwan, when the rebirth of China finally comes. Dear beloved Bishop Ignatius, you will not read this letter on earth. But through the Communion of Saints, in the Heart of Jesus, sharing His Holy Priesthood, we keep united for ever, and we shall meet again in Heaven. I was living in Shanghai when you became Bishop. I was expelled against my will. Since I had hoped to spend my missionary life in your Diocese, I have kept your name in the Memento of my Masses, every day since then. In spirit, I humbly kneel before you and kiss your episcopal ring and the glorious chains of your martyrdom, begging your blessing. 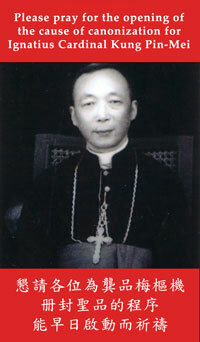 Bishop "prisoner for Christ" of Shanghai. Since my first "open letter" Sept 1984, the world has been informed through the communication median that the Communist Government has released you from prison "on parole" after 30 years in jail. Of course, we have been told by your jailer that you have "admitted your crimes". And as a matter of fact, you have been given to the "Patriotic Association of the Catholic Church" to be watched over, under the responsibility of the Bishop - and his two Auxiliary Bishops - who have usurped your episcopal Sea of Shanghai. Although we were asked to believe that it is a "liberation", no one is allowed to see you, except your new jailer. Dear Bishop Ignatius, once again the "scholars" and the "diplomats" will see in this a "friendly gesture" from the Communist Government. They will be ready to forget the martyrs who have given their lives after years of prison or labour camps, or are still prisoners like you. As I told you in my first letter, they are the "noisy minority", who fill magazines and newspapers with plenty of "ways of compromising", disregarding completely those with whom they are compromising, namely, a Government whose aim is to destroy all religion and which has discovered that the best means to do so is to create a "puppet Church", separated from Rome, (that is: schismatic). This is the very thing you have been refusing from the beginning and you have spent 30 years in prison out of loyalty to this principle. But once again I tell you that there is a "silent majority" who see things differently. For us, your so-called "release" is just like "Pilate handing Jesus over to Herod" to get rid of him! No one of us, the "silent majority"' believes that you have "acknowledged your crimes", or "given your submission to the Patriotic Church". So much so, that one of the Auxiliary Bishops of the Patriotic Church, in Hong Kong a few weeks later, had to acknowledge at a Press Conference that "actually you had not"! So this is the explanation of your confinement after a much publicized "release"! Dear Bishop Ignatius, in the depth of our heart we are totally with you in this new "ordeal". One more thorn has been added to your crown. One more slap has been given to you. As with Jesus, one more insult has been added. People laughed at Him nailed on the Cross under the inscription: "The king of the Jews"! And now, you, the only lawful Bishop of Shanghai, faithful to the Holy See, have been given over to the one who has usurped your place for more than two decades and to his two new Auxiliaries, the three of them without "mandate" from Rome and "excommunicated" according to Cannon Law No. 1382! One of them is now going around the world trying to fool us about the "freedom of religion" the Government of the Communists is offering through the so-called "Patriotic Church", with no communication with the Pope and always "criticizing the Vatican" for its past and present policy. This is a true "Puppet Church", a "bait" to attract naive people. But, dear beloved Father Ignatius, stronger than his vice, your "silent voice of Prisoner for Christ" resounds in our hearts. Not only to us here in the free Province of Taiwan, but to all the "overseas Chinese" all over the world. Your voice, like the one of St. Paul, reminds us to be faithful to Christ, to His one Church, the Church presided over by Peter, Bishop of Rome and his successors. Complete faithfulness to the sea of Peter, the faithfulness of love, with no sense of grievance or compromise and this until martyrdom when the time comes. With Paul to Timothy, (2 Tim. II 8 - 13), your silent voice of a "Prisoner for Christ" tells us: "Remember the Good News that I carry, 'Jesus Christ risen from the dead...'; it is on account of this that I have my own hardships to bear, even to being chained like a criminal - but they cannot chain up God's News. So I bear it all for the sake of those who are chosen, so that in the end they may have the salvation that is in Christ Jesus and the eternal glory that comes with it. Here is a saying you can rely on: If we have died with Him, then we shall live with Him. If we hold firm, then we shall reign with Him. If we disown Him, then He will disown us. we may be unfaithful, but He is always faithful, for He cannot disown His own self." Dear Bishop Ignatius, we are sure that our Blessed Mother of Zose is keeping you in Her tender care. With you we pray to Her that She may keep and protect the "true" Catholic Church in China, the one still martyred and in the catacombs on the mainland, and the one still free and faithful to Rome, in the Province of Taiwan. With you too, we pray to Her for the poor people of the Patriotic Church who have gone astray, "not knowing what they are doing..."! May the Peace of Christ, the Love of the Father, the Light of the Spirit be with you. Again, kneeling in spirit before you, I kiss your episcopal ring and the chains of your captivity and I beg your blessing.